Randy Parson, an employee of Tira Builders of Hillsboro, cleans up the front entryway of the Highland County Courthouse Tuesday afternoon in preparation for the installation of new front doors. 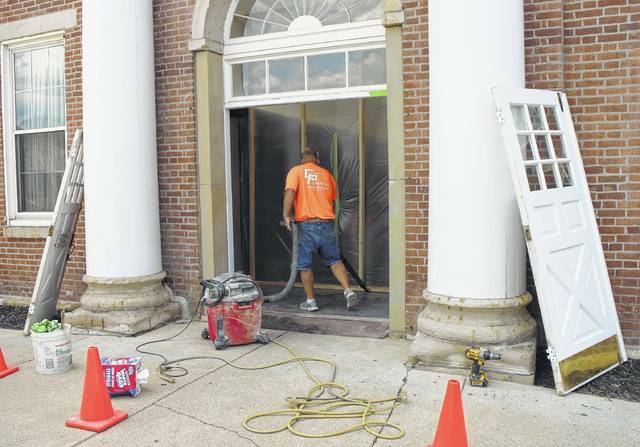 Work continues on restoring the interior and exterior of the courthouse and adjacent Highland County Prosecutor’s Office, including the office’s HVAC system, which has caused maintenance headaches - and even fires - for years. In the oldest continuously used courthouse in the state of Ohio, battling the elements seems to be a part of everyday life — and, while temperatures rise, work continues on climate control solutions at the adjacent Highland County Prosecutor’s Office. Highland County Prosecutor Anneka Collins told The Times-Gazette Tuesday afternoon that her office’s HVAC system has been faulty for some time, and her staff has reached a consensus on the matter. “It’s hot,” the prosecutor said over the hum of fans set up throughout the office. Assistant prosecutor Molly Bolek said the best way to combat the heat is with a cold treat. Bolek insisted that the morning ice cream fix was important for her pregnancy. According to Bolek, the extreme temperatures in the past have come with a cost — she nearly lost a pet fish to a wintry blast before former Highland County Sheriff Richard Warner revived the aquatic pet. “He saw its mouth move, and he put it in warm water and saved it,” Bolek said. A fish in Collins’ office, however, was not so lucky — the creature froze to death during a cold snap, according to the prosecutor. Collins said the climate control issue has plagued the courthouse for years due to the building’s outdated HVAC system. According to Collins, bad wiring in the walls caught fire twice last year, and that wasn’t the first time it had happened. “We’re used to it at this point,” she said. Collins, whose office is located on the second floor of the old stone county jail building adjacent to the courthouse, said she appreciated the Highland County Board of Commissioners for their efforts to address the problem. But she said she hopes it’s fixed sooner rather than later – preferably in time for upcoming grand jury deliberations. Highland County Board of Commissioners President Shane Wilkin said the commissioners are working with Plug Smart, a Columbus-based energy efficiency company, and Greenfield-based Weller’s Plumbing and Heating to find a fix. “We are working with Plug Smart and Weller’s to find a solution as quickly as we can regarding the HVAC issues they have been experiencing in the courthouse,” Wilkin said. In the meantime, work continues on restoring the courthouse’s exterior. A two-man crew was out Tuesday afternoon installing new front doors in the building’s main entryway. Brad Tira, owner of Tira Builders of Hillsboro, told The Times-Gazette that the project was a little more complicated than he had anticipated, but that they would have a set of new, custom-made mahogany doors installed by Wednesday. Randy Parson, an employee of Tira Builders of Hillsboro, cleans up the front entryway of the Highland County Courthouse Tuesday afternoon in preparation for the installation of new front doors. Work continues on restoring the interior and exterior of the courthouse and adjacent Highland County Prosecutor’s Office, including the office’s HVAC system, which has caused maintenance headaches – and even fires – for years.